You’ll find East Coffee Company on Duke Street, midway between Bellgrove and Duke Street train stations. Also on several bus routes, it’s easy to reach by public transport. My attempts to sneak in unrecognised failed almost immediately since the owner, Sean, who opened East with business partner Niall, spotted me pretty much as soon as I came in. We’d previously met over three years before when he was manager/head barista at Meadow Road Coffee, so he has an impressive memory! I was well looked after by Sean and the equally lovely Gosia. Long and thin, East has a single, square window on the right, glass door on the left. There’s a solitary bench in front of the window, while inside, the front is dominated by the counter on the left-hand side. The seating, meanwhile, is on the right, with more in the back room, accessible via three broad steps which lead up through an opening on the right-hand side of the back wall. The counter is set back from the door, where you’ll find a handful of stools, although I suspect that they’re more for people waiting for takeaway coffee. There’s a bench in the window to the right of the door, mirroring the one outside, while a girder that holds up the ceiling just inside the door on the right has been used to good effect, where a small shelf, plus a stool, provides an extra seat. A row of five square, two-person tables starts on the other side of the girder, with seating provided by a pair of long benches. These are followed by two shorter benches separated by stools, leaving just enough space between the far edges of the tables and the girder/counter on the left. In contrast to the long, thin front room, the back room is cube-shaped. There’s a toilet in the back right-hand corner, with a two/three person table against each of the left, right and front walls, the seating provided by stools. Both rooms have wonderfully high ceilings, while there’s a little bit of natural light from the main window at the front and a smaller window in the back wall of the back room. The rest of the space is illuminated by a combination of well-placed spot lights and exposed lightbulbs hanging down from the ceiling. The décor is best described as “unfinished”, with a tiled floor, while the bare walls retain the occasional hint of the original features. I particularly liked the lighting rose in the centre of an otherwise plain ceiling. East offers table service, so take a seat and you’ll be handed a bottle of water and a menu. 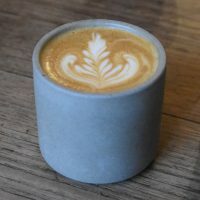 I got things going with a lovely flat white, served in a gorgeous, handless, cylindrical ceramic cup. The coffee went very well with the rich, creamy milk, which held the latte art pretty much to the bottom of the cup. I paired this with the Brekky Eggs, an interesting variation on the traditional Eggs Benedict/Royale/Florentine (but with no Hollandaise sauce). I selected the vegetarian equivalent, asparagus, spinach, avocado and walnuts with toasted sesame seeds and pumpkin seeds, topped off with a balsamic glaze, all on sourdough toast. It was excellent, really interesting combination of flavours and textures. I finished things off with the batch-brew, a smooth, well-rounded cup of coffee. This entry was posted in Breakfast, Cafes, Cake, Glasgow, Lunch and tagged good coffee cartel, include, Sacred Grounds by Brian Williams. Bookmark the permalink.